What happens when you take the gentility of a Chukka and combine it with the ingenuity of our ZERØGRAND technology? The ZERØGRAND Chukka with Stitchlite™ Wool. This handsome American classic features an EVA midsole with a deep grooved outsole to aid flexing and a genuine natural storm welt, increasing durability and weather resistance. Stitchlite™ Wool is a winterized premium wool blend that breathes easy, minimizes odor, and naturally insulates to keep your feet warm and cozy. All while repelling heat and moisture so stay comfortable. Very comfortable and stylish. I ordered my normal size but I could have went a half size down. Love these boots. They run true to size. They look great, are well made and very comfortable. This is my 4th Zerogrand product and I’ve loved them all. I purchased these boots for winter and wear them 75% of the time. Like their matching shoe version, these are the most comfortable shoes I’ve ever worn. I pair the with jeans and a blazer and I’m good to go. I really like the Stitchlite. They are very light and comfortable. I purchased a pair for my and she is very happy. I would like to colors expanded. Haunting style. Extreme comfort. Excellent quality. Everyone knew immediately that they were Cole Haan. Nice shoes perfect fit very comfortable and keep your feet warm. So comfortable and stylish. Always get lots of compliments. Very comfortable and love the style. Receive compliments every time I wear them. Most comfortable shoe I’ve ever bought. I’ve never had a shoe this comfortable. Light weight but yet warm and comfortable. The shoe looks awesome! black soles helps the shoe standout! They look cozy, dressy and sporty. If they help regulate foot temp/sweat, even better! The wool look, anticipated comfort, and darker sole! My nephew had a pair that I saw and liked so I purchased a pair for my son for Christmas! Cole Haan sells quality products and is committed to customer service. This wool looks awesome and I need this in my life soonest since I recently received orders to Groton, CT I would like to think this will be a very trendy but functional option for me that I am sure will turn some heads! #BringontheSnow! I would like a pair in gray size 8. Can I get one? BEST ANSWER: This style was a one-season, limited production shoe. We will most likely not be offering it again, but very likely may have something similar in coming seasons. 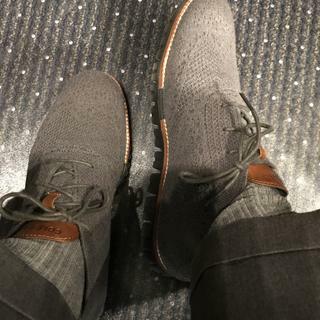 You can try an online search for "Cole Haan ZeroGrand Chukka Stitchlite Gray". Is there a safe treatment available to protect this material against stains and water damage? BEST ANSWER: Suede and fabric uppers may benefit from occasional applications of waterproof spray applied according to manufacturer directions. Waterproof spray will act as a moisture repellant, providing a light layer of protection from light moisture and soil. It will not make the leather or fabric waterproof. BEST ANSWER: To view our return policy, click on 'Returns and Exchanges' located under Assistance.